I am a big supporter of children's artwork. 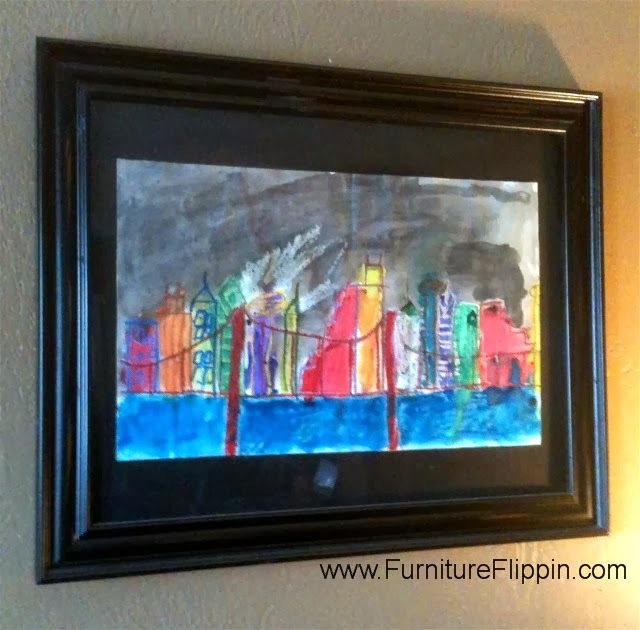 I have no fewer than four framed pieces of my youngest son's artwork gracing the walls of our humble abode. > > > > > > That one is a centerpiece on one wall. It proudly hangs above the Dumpster Dresser in our family room flanked by two of his framed self-portraits. As children we were encouraged to be artistic although the only two who really possessed those genes are my sister Rebecca and brother Michael. (Sorry Lee Ann but you have to admit we were shorted our fair share there.) I do remember excitedly coming home with this fingerpainting I had made in kindergarten. My mom and I rummaged through the basement for a frame for it. Then it was presented to my dad for his birthday. Can you tell what it says? He proudly displayed that artwork from that day forward. It only came to be mine again after his passing. So, while I am a big supporter of the art, I'm not a huge fan of it when it involves markers, nail polish and ink drawings on furniture. No matter what my mother may tell you about an incident involving a two year old me, a bottle of nail polish and her new upholstered rocking chair. (I'll never live that down.) Check out the before pictures on these two pieces that Sue from The Browsing Butterfly picked up. It looks as if these had already received one makeover before Sue snatched them up. Sue sanded, primed and painted. The tops were in pretty bad shape so she chose to use a sandy textured paint on top followed by some poly to smooth out over the top of it. 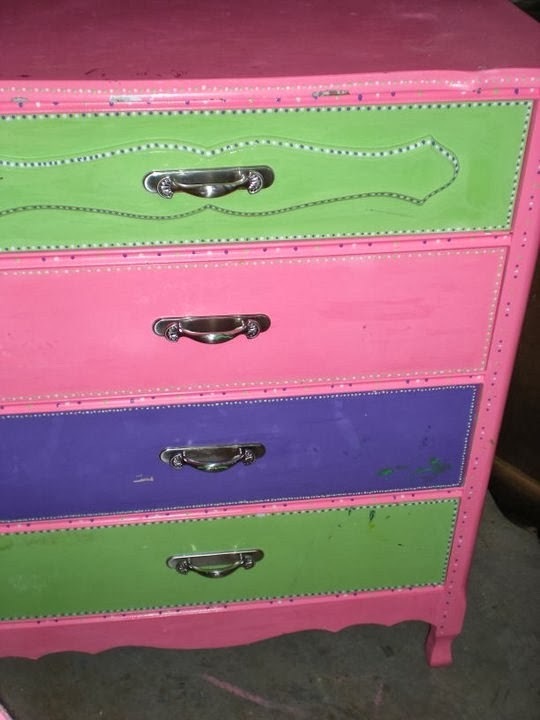 She also used the same textured paint on the drawer face plates that stick out from the rest of the drawer. 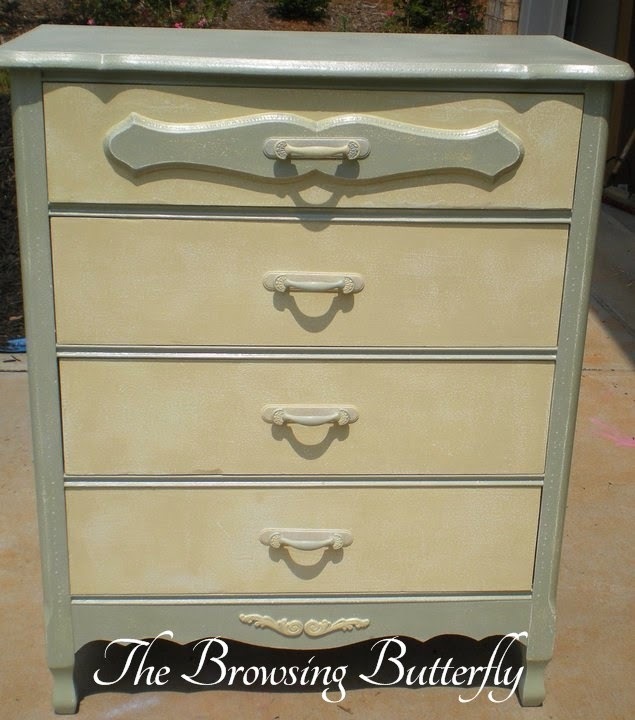 Finally she sponge painted (creamy yellow & pale green) the dresser for a warm creamy look. Check out the other one, too. 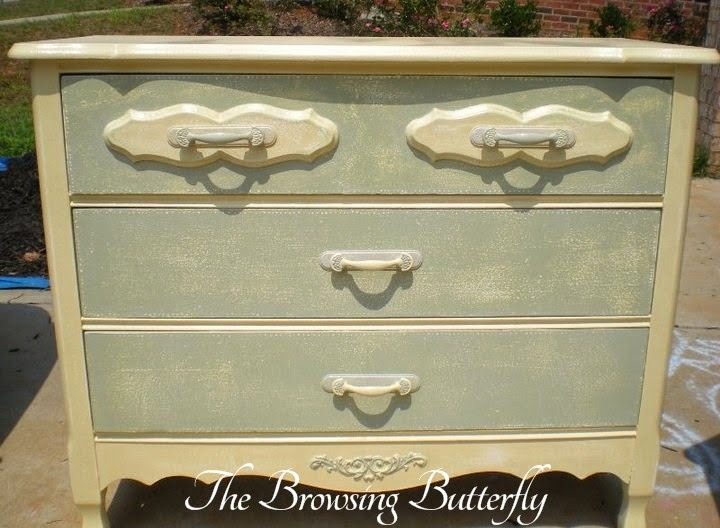 The Browsing Butterfly is located in Holly Springs, North Carolina. 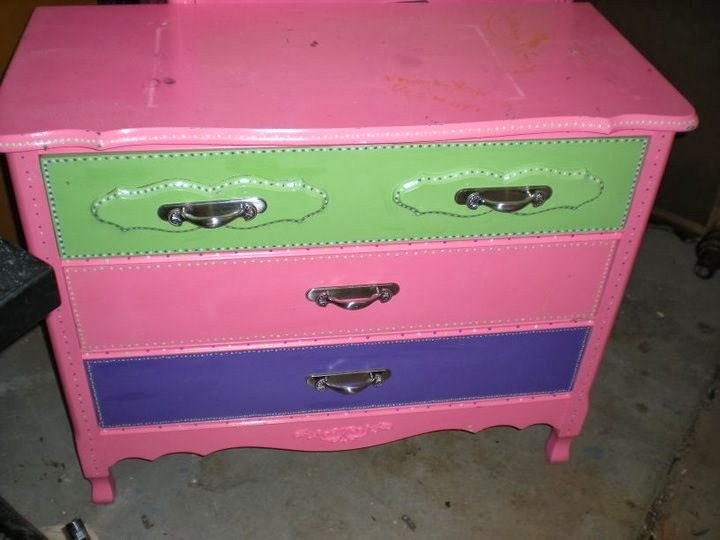 Sue loves finding trashbound pieces and transforming them. Head on over to The Browsing Butterfly Facebook page and check out more of her work. Let her know you saw her on Furniture Flippin' and tell her to hurry up and get that radio cabinet finished while you are there. 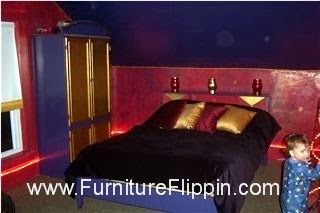 Thanks so much Sue for sharing your fantastic furniture flips! That brings us to the end of another week of Furniture Flippin'. Five more pieces transformed. Did you see them all? Scroll back a few pages and check out what you might have missed. I'll see you on Monday! Plus, I'll be checking in with you over the weekend on our Twitter, Pinterest and Facebook pages. Have a great weekend and submit your flip! Thanks for the feature!! This is one of my all time favorites!! From gaudy to beautiful. Awesome job! Beautiful work, the dressers are stunning!